Tributo de Guillermo De Toro: "Blade 2"
The sequel to the 1998 graphic novel-adapted film “Blade” was given to Guillermo Del Toro to direct for a 2002 release. Starring Wesely Snipes as the half man half vampire and his father figure side kick Whistler, played by Kris Kristofferson. Although they had seemingly killed off Whistler in the first film he is back along with another team member Scud, played by Norman Reedus. “Blade 2” has Snipes battling the Reapers, a race of mutated vampires with a voracious appetite for blood. Kind of like cool looking zombies but were calling them Reapers, they threaten to not only wipe out all vampires but humans as well. The Shadow Council enlists the help of Blade and his team to wipe them out for good. 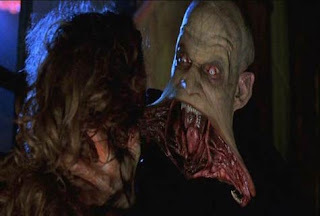 The Reapers as characters are pretty cool looking with their best feature being their mouths that shall we say open really wide, something that is seen later in the Resident Evil Movies. Del Toro’s trademark blue and gold lighting schemes can be seen throughout and as mentioned the character designs are top notch. The effects are well done, especially the Reaper autopsy scene. Del Toro also must have scenes with medical specimens floating in jars. The film is through and through a comic book movie, mixing everything from Japanese Anime influences and hyper-real violence to WWE style fight scenes. 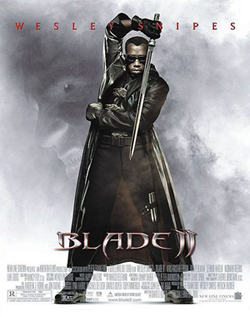 Action movies do have a tendency to be a little boring and repetitive at times, but “Blade 2” knows what it is and aim to be as entertaining as possible. It does fall into certain genre trappings, such as the “seen it before” climax and rather ridiculously sappy ending. Although the “Blade” films do have their audience (13-14 year old boys) I really don’t think it is the film for me.